There are many verses in the bible talking about spiritual food issue. Some verses are avoided on eating some foods while the other verses say that we can eat all foods. In Old Testament, the bible said that you should not eat any meat that still has the lifeblood in it (Genesis 9:4). That message was specified only for his people Israelite; you can read it in a whole chapter of Genesis 9 to make it clear for you. God gave this message to some reasons:  God want his people (Israelite) unique to other countries that surround them. God want to test them how much of their faith in him. God taught them in the first lesson how to clean the self. But when Jesus Christ came, no more clean and unclean foods, he stopped that law for his follower because nobody becomes good in the eyes of God on following the law of food (Hebrews 13:9). Jesus Christ tell them that any kind of foods cannot make you dirty (in spiritual food situation), all kind of foods can be eat, and is acceptable in God’s eyes (Mark 7:18-19). In the new testament when apostles was newly convert to Christianity, they still allow people to follow the law of food (Acts 15:29), so that people don’t be surprised and feel heavy to the new doctrine in Christianity. In the long run, they slowly change the doctrine, but everyone is free to follow either what they believe is good or bad. That’s why that time Paul said to believers that those eat anything don’t judge to the one who eat only vegetables, and those eat only vegetables don’t judge to the one who eat anything, for God has accepted them (Romans 14:3). 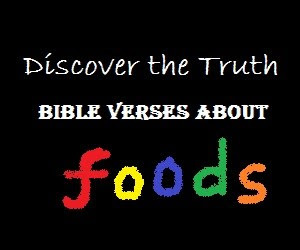 Now that you recognize the bible verses about food what do you think? I can say that foods is no longer the basis for the redemption because Paul said that food is not the basis to become good to the eyes of God or bad for us if we don’t eat it, or good for us if we do (1 Corinthians 8:8). According to Paul that we can eat anything, and do it to the glory of God (1 Corinthians 10:25, 31), so, every time we eat food we should give thank to the Lord and don’t let anyone judge you for eating any kind of foods (Colossians 2:16-17). Hope it helps to clear your mind about spiritual food. Thanks’ be to God! Christian should be no worry about food because Jesus Christ not forbidding us to eat some foods. The Old testament is the covenant between Israelite and God.